Hope everyone had a wonderful weekend. We had thunderstorms on and off and supposed to be the same the next few days. With my renewed interest in crocheting over the past few months. I knew I needed to set some rules or the yarn would start to build up as the paper and stuff did for the paper crafting. So the main rule is I can't build up a yarn stash. I must find something that will use up all left over yarn. I had yarn left over from the afghan I made my sister for her birthday you can see it here. 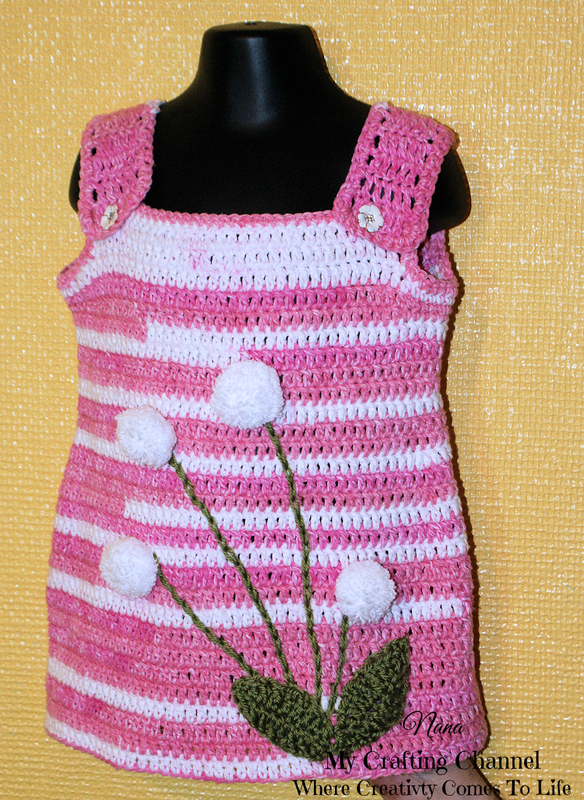 So this morning I would like to share this cute little girl Dandelion Dress & Hat Set made with that left over yarn. I saw this cute pattern and knew I had to give it a try. I had never crocheted clothes before, well I did make a baby dress for Pam's new grand baby that is due soon and that dress I will post in a few days. 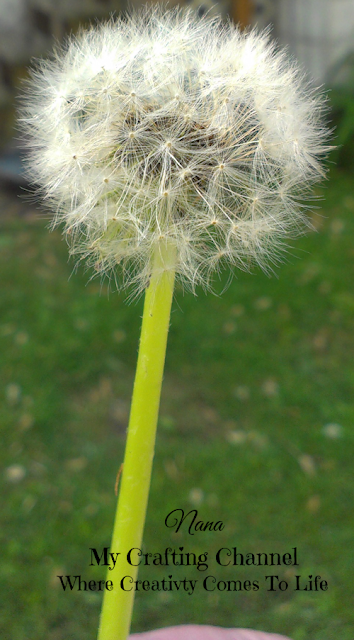 I remember when Barbi was little she loved to blow on the Dandelion's when they turned white and make wishes. In the pattern Ruby made her flowers yellow, I changed mine to white. I think any little girl would look adorable running around in this cutie. It' so soft, made with 100% cotton so it will be cool for this hot summer days. Adjustable Length: 18", 17 1/2", 17", 16 1/2". Really cute...love the pom pom dandelions! Whoa....how stinken cute is this?! Wow Nana, you are so talented. This is so beautiful and absolutely adorable~fun colors and love the dandelions! What a darling set! The dandelion are just darling! Such a precious set!! WOW!! Amazing job!! How adorable! Looks like those dandelion puffs could just blow away. You are really going to town on the crocheting. I must learn to crochet! After I finish all my baby projects maybe I can practice with the link you sent me. WOW!! This dress and hat are BEAUTIFUL!!! Love the dandelions and the pretty color!!! Have a great day. Oh my goodness this is adorable! Fabulous crochet and flowers!